My name is Terri Webster Schrandt and I blog about the fun things in life from my perspective. I take leisure very seriously because it involves one-third of our lives…really! Most of my posts reflect my leisure places & spaces and my reactions to them. I share a variety of stories all related to a healthy leisure lifestyle. I use all my own images for my posts and participate in several photography challenges. If you like what you have read so far, please subscribe to my blog! I love photography and I take tons of photos with my Samsung phone and my digital camera! There are a variety of photography challenges available and most are open to everyone. Sunday Stills Photo Challenge hosted by me! A themed weekly photography feature with a link-up. Pingbacks and link-ups help bloggers discover other bloggers. Cee’s Photography hosts several of her own photo challenges and keeps a listing of other blogger’s photo challenges. Once I began writing posts for my blog, I quickly saw the importance of featuring a compelling image to illustrate the post’s content. As I further honed my writing and photography skills, the idea of a guidebook came to mind. 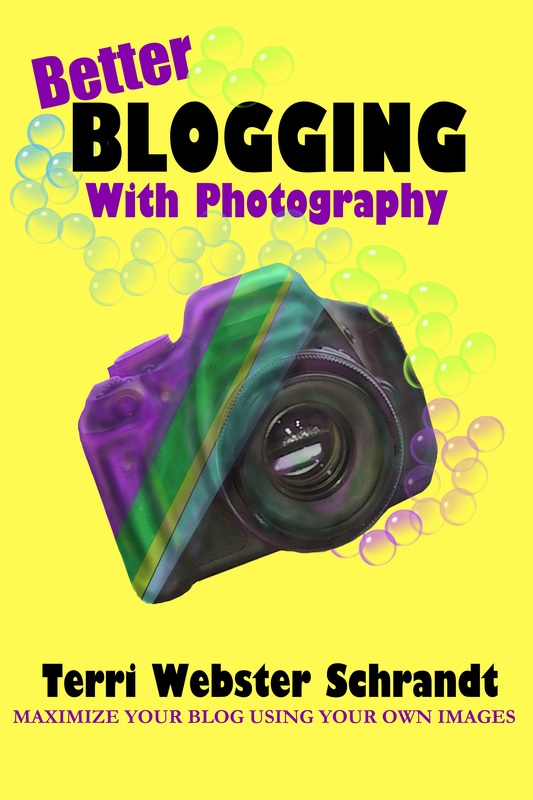 My first eBook, Better Blogging with Photography, was published on Amazon Kindle in July 2016. Read more on my book page. My summer weekends are spent in the Sacramento delta windsurfing and stand-up paddling (SUP) with my husband of three years (we knew each other in high school and found each other on Facebook—read about that here). The ultimate goal with this blog is to educate people about the importance of leisure, one blog post at a time! I love photography and constantly take pics with my Lumix FZ-300 and my Samsung Galaxy mobile phone. Sharing these photos in posts and on Instagram is a much-loved hobby! My ultimate goal? To continue to write and self-publish non-fiction e-books. Thank you, Da-Al, I’ll come have a look!! Thank you for following my blog Terri! Looking forward to getting to know you better Terri! I like your “why’s”! You certainly have lots going on in your leisure life. So do all of us in our large family. I look forward to reading from your varied topics. I too plan to blog a book filled with my various life stories and interests. They’re way too varied to peg them into one category. I’m glad to meet you. Thank you, and nice to meet you too! HI, Terri! Thanks for stopping by my blog and liking my post More bad news on extra belly fat. Congrats on your retirement! That’s a wonderful achievement. You certainly seem to be doing a great job of it. Really like your photography, too. Thank you, Tony! Well, I thought I retired…teaching 15 units a year at a university as a lecturer keeps me busy! You have a great blog with such relevant information! Thanks, Terri! I am enjoying yours, too. I taught journalism at Northwestern for a couple of years after retiring. Liked it a lot. Learned a lot. Teaching can be very rewarding! What a wonderful About-me-page. I always read people’s About-page just to know which interests people have, what they do or have done. I think that About-page is a window to blogger’s world, telling about his / her world with text and photos. It is a richness that we all are different with different hobbies and interests, but at same time finding some similar things which touch both readers and the blogger itself. Although I am a senior citizen, my life differs from yours, but at same time, there are similar things like life activities and finding things, which keep us young and our brains fresh. Retirement is not the end of life, but the beginning of new active life. Here is my About me. Cheers from the Winter Wonderland – Finland. Wonderful to meet you Terri. Love the look of your blog which I’ve only just discovered and look forward to exploring more. Cheers from a wonder lusting travel loving woman from Australia. Thank you, Miriam, for stopping by and following! Terri, I love the idea of a blog about leisure! I think it’s a lost art. We work too hard and for too long. Not to mention take live too seriously. I’m glad you found my blog, thanks for following. Hope you’ll stop by often, doors always open at Jean’s Writing. So nice to meet you, Sherri, and thank you for your kind words! Good luck on your memoirs! You’re very welcome Terri, and thank you so much! Thank you,. Van, your comments are very encouraging! “Leisure educator” – love that job title! I look forward to following along. I of course enjoy leisure and blogging, so I’m sure to enjoy your content! Hi Terri, Really looking forward to exploring your blog further! I see we participate in some of the same photo challenges and I want to check out yours. Can I ask you a question please? I have just started a second blog and am trying to figure out how word press works. If you click on my name to get to my blog does it take you to my original blog ( nihongojapango) or my new photographic blog ( you inspire me). Interested to know as I want to get a collection of photographic blogs to follow under my photographic blog umbrella but in terms of the like and comment notifications everything just comes in jumbled up for both blogs. Hi Leanne, thanks for checking out my blog and for following–back atcha! When I click on your name it goes to your main blog. I saw your photoblog in your menu. Thanks Teri That&s Great to know! Thanks for remaining a reader and follower of mine, much appreciated! Oh thank you Angie for the nomination, and I am flattered. I’ve been following you for a long time 🙂 Congrats on YOUR nomination of the award! Yes, you have been following me for a long time, which I really really appreciate!!! Thank you and you are welcome! Oh thank you, Jenny! Much appreciated! Hi Terri – your blog looks terrific, and I love to see people over 50 (heehee, one of my blogs is http://www.howtobe50.wordpress.com) doing such cool stuff! Hope to see you around the blogosphere! Thank you, Charlotte, how kind of you! You’re welcome Terri, very deserved, congratulations! I find this a fascinating blog. Love the pictures too. Hi Terri, Thank you so much for the visit and follow, You got a nice blog, am looking forward on reading your future articles. Godbless. Really kind of the follow. I am a firm believer in leisure. Like which ever wise person said, ‘i love work; I can sit and watch it for hours’ personally I walk more than anything (apart from baking maybe) so I may bump into you in the great outdoors sometime, if not then in this blog! Hi;. Nice to find your blog today, you sound a very vibrant and interesting lady. Looking forward to all your leisure posts. Hi you have such an interesting place here! I’m anxious to participate in the Leisure Link blogging event! Headed out to browse around! Why thank you! I would love to have you participate! Thanks for stopping by! Thank you for the nomination, Tessa! Hello! I nominated you for an Encouraging Thunder award!! Quite an interesting bio! I am nearing retirement. A child of the 50’s, my wife and I have 5 teenage daughters (all adopted) at home while our bio daughter is married and doing well. I am looking forward to travel and photography during the retirement years. I started to the blog as a preemptive entry into that sphere! Thanks for stopping by my blog – I enter many of the photo challenges that you do so we should run across each other from time to time. Hi Dennis, so nice to meet you! You sound like a busy dad. I shall come check out your blog and thank you for stopping by! Look forward to seeing your photos! Thank you Terri! And (phew!) I am busy. We have daughter #2 ready to go to college now with four more just behind her. Retirement will be the only solution after all that! I wanted to let you know that I nominated you for the Liebster Award. Here are the details should you wish to proceed. I love your website. Thank you for the honor, Sue. Hope you had a Beautiful mother’s day! Thank you. Have a great day Terri. Thank you , Lucy! I love reading your blog. Thank you for the nomination! It’s a pleasure, felt you were very deserving of it. Thanks for following us Terri 🙂 Happy to have found your blog as well! We just moved to New Zealand and I am loving all the water sports here – I see lot of Stand up paddleboarding, looks fun! We just took up sea kayaking for now, and I can’t wait to get my refresher diving course done so can start scuba diving again 🙂 Look forward to sharing and reading more posts of life and outdoors leisure! That’s just wonderful, relaxing fun! Your page is ridiculously popular and well deserved, since you write about what puts smiles on most people’s faces. I enjoy what you are doing. God bless and keep having fun! Sounds good. I can start next week when I get home. If you do participate, have fun! Thanks, Terry, I kind of figured it was just a matter of time 😉 I’m happy to accept and will start on Monday! Why thank you!! I shall check your out as well. Thanks for the follow Terri. I’m so glad I stumbled on your blog. I was inspired to create a collage of examples regarding the Blogging 201 assignments AND included you! Hopefully this will send more support your way. Check out the post and the other blogs when you can. Thanks! As always, you are under no obligation to accept or acknowledge this nomination. I enjoy your blog, and hope that this nomination encourages others to read it as well. My goodness! Oh the pressure! Thanks so much Carol. I’ve got some work to do! to be totally honest, these awards really are a lot of work. But I’m still new at this, so it’s kind of fun for me, too. Thank you, Carol I am honored! I’ll check it out! Pingback: 2014 – Recap | Gluten Free. Lekker food! Lekker life! I just read your interview and found it very interesting and thank you for adding me as one of your favorite blogs. I am so glad that you enjoy reading my blog and I also look forward to reading your blog. Best wishes. Thank you Sandi! I really appreciate the honor!! You are very welcome! By the way, I got the name mixed up when I posted on your “About” page, but it is right in my blog (I think). It is the Virtual Blog Tour Award. Hello there! Just tuned into your blog and gave you a follow. If you want to see what’s up in my world, head on over to http://www.thatssojacob.wordpress.com and enjoy yourself. Have a good one! Thanks for the follow! I’m now following you, too! Looking forward to your posts! thank you very much, cool honor! Hi. I stumbled across your blog in the Reader. I would love to hear more about women in leadership. Looking forward to following your journey. thanks again! there is another blogger I follow on this subject: @womenachievinggoals, you would like her! I am looking forward to following your blog , sounds like a lot of wonderful ideas are going to be generated through it lots of luck and happiness to you. Kathy. Your goals are very specific. I like the list you’ve generated. I might add something similar to my about page. Thank you Adel! I will take a look at your site today! Hi Raj, thanks for stopping by, congrats on your impending retirement as well! We can keep up with each other’s “escapades” on our blogs! Hello, to you, I have nominated you for the Liebster Award. Check out my post on my blog at http://mackey6.wordpress.com I hope you choose to accept it. Thank you very much! It’s really an honor! Nice work! I have nominated you for the one lovely blog award! You sound like you have it all together. Retirement should be fun! You are going to be so busy! Hi susan, I must have missed this! Thank you so much for the nomination! I think you have a wonderful life. Thanks for sharing about it! I appreciate you liking my comment and I’m glad to have found you through you like! Hello! I’ve nominated you for the “One Lovely Blog Award” if you’d like to participate! Thank you, Lia, for thinking of me! I was nominated already so I can only accept one 🙂 I really like your blog–seems we have similar interests! Hi! Thanks for your reply… I completely understand and I’m glad your blog was also awarded by other bloggers! Its great! I’m glad you enjoy reading my blog and that we have similar interests as well! Thank you, how cool! I will check it out! I have retired and I continue discovering the many facets of the new chapter of my life. I’m interested in leaning more about your masters thesis in the field of “Four Generations in the work place”. I’m constantly learning and planning to move west via RV. You have a wonderful site and I will follow. Thanks for the follow Terri – I like where you’re coming from – an interesting perspective! Great blog! Good luck as you ease into retirement…the transition sounds like it’s going to be a smooth one! And I just edited it for the assignment. Thanks for all your likes and comments! Good luck Terri. It looks like the blogging is going well. Hugs! 🙂 I see we are fellow Saggitarians! I have a lot of great information that I think many folks will find useful! Please share this blog with others! I know a friend who would love to connect with you, as well. Good luck with all your projects, and May God Bless You in Your Next Journey! thank you again! As soon as I retire (42 more days! ), I’m launching my business. Thank you for your support!